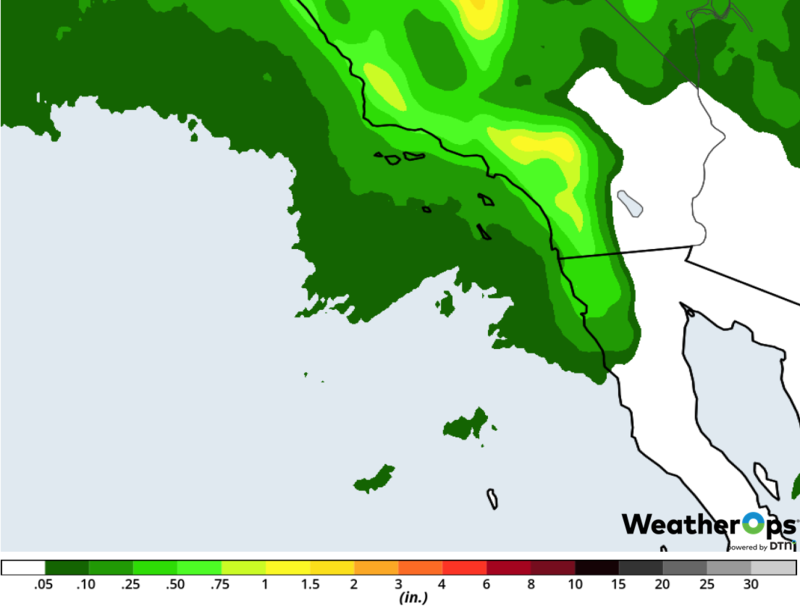 Excessive rainfall is expected across southern California on Monday as an area of low pressure moves into the region. 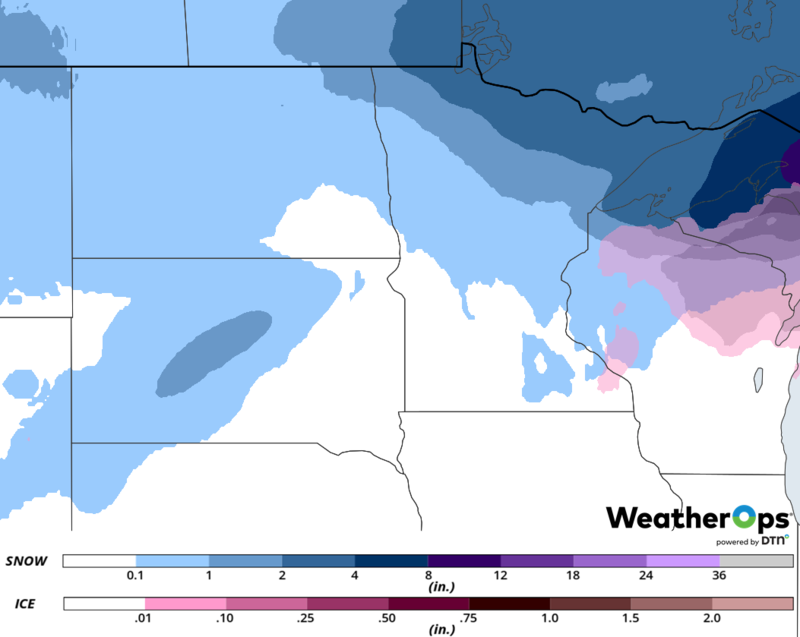 Snow will continue across the Upper Midwest as a disturbance continues to track eastward. An area of low pressure will bring snow to portions of Oregon through Tuesday afternoon. A series of disturbances will bring snow across the Sierra Nevadas through Tuesday. Dense fog is expected to persist along the Texas and Louisiana coasts through Wednesday morning. An area of low pressure is forecast to move into portions of Southern California on Monday. Abundant moisture is expected to overspread the region, leading to the development of showers and thunderstorms, some of which may produce heavy rainfall. Rainfall accumulations will range 1-2 inches with locally higher amounts in excess of 3 inches. Although rainfall will be lighter than previous days, due to past rainfall and recent fires there will be an increased risk for flash flooding, mudslides, and excessive runoff. 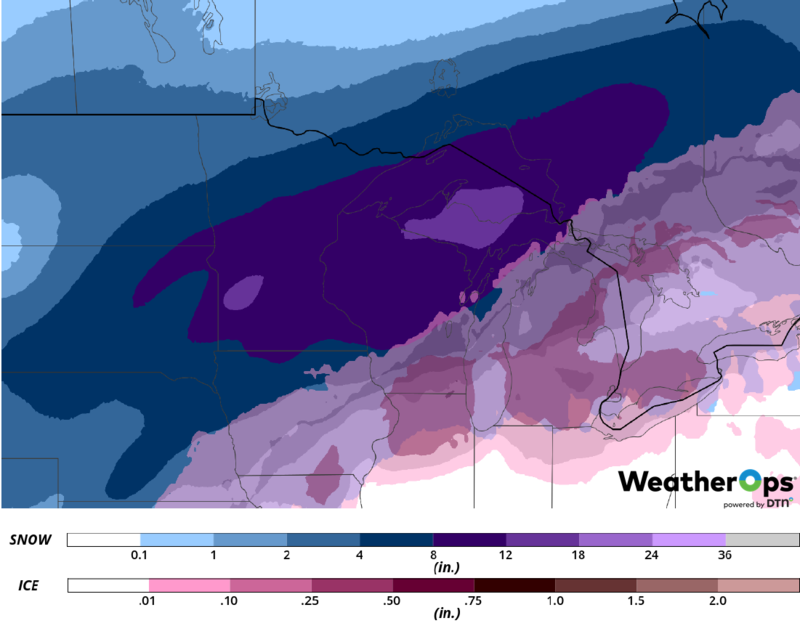 A winter storm is ongoing across the Upper Midwest. This storm is forecast to continue to track eastward, bringing widespread wintry weather to the region. 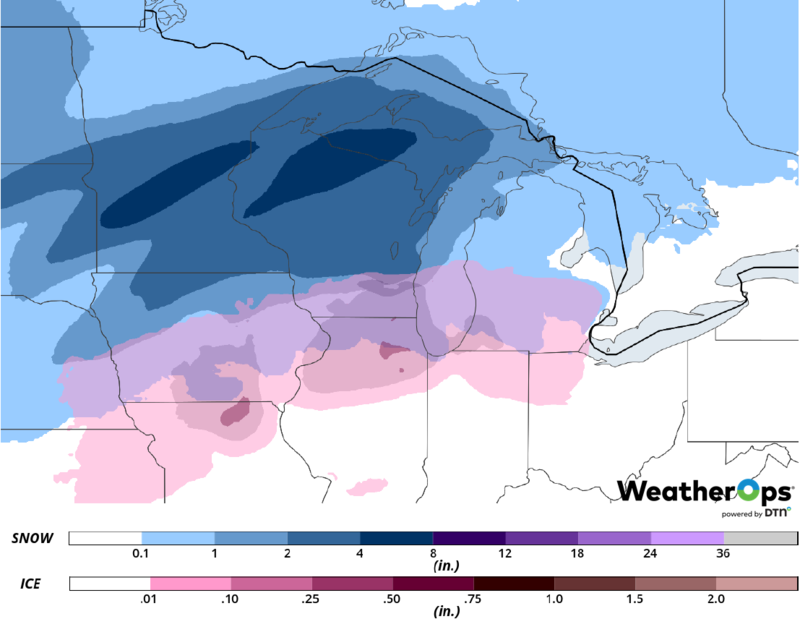 Snowfall is forecast to spread eastward across northern Minnesota with freezing rain across the Upper Peninsula of Michigan. Snowfall amounts of 6-12 inches are expected in addition to freezing rain accumulations ranging 0.10-0.25 inch. This will cause hazardous driving conditions. In addition, wind gusts in excess of 35 mph could result in blowing snow and reduced visibilities. An area of low pressure system is moving into the Pacific Northwest today, bringing ample moisture to the region. This will produce light to moderate snow across the area above 4,000 feet and rainfall below 4,000 feet this evening. However, late tonight snow levels will fall as another low pressure system enters the region bringing another threat for light to moderate snowfall. Snowfall accumulations of 3-6 inches with locally higher amounts in excess of 8 inches are forecast below 4000 feet with higher amounts above 4000 feet. Snowfall will quickly end from west to east on Tuesday as this low exits the region. Multiple rounds of heavy snowfall are expected through Tuesday. Heavy snowfall has already fallen on previous days from the first disturbance to impact the region and more heavy snow is forecast as a secondary upper-low moves into the Four Corners from the west. As such, an extended period of moderate to heavy snow is forecast from through Tuesday night. Total snowfall amounts through the event will likely be on the order of several feet, with the lower elevations expected to experience anywhere from 3-5 feet through Tuesday night. Meanwhile, the higher elevations could receive up to 7 feet in some locations. Travel will be hazardous. In addition to snow on roads, visibilities will be very low and less than a half a mile, with blustery winds over the higher terrain. Dense fog will persist on Monday as moisture and light winds remain in place. Visibilities along the Texas coast will be below a mile at times. Winds will increase during the evening, allowing the fog to dissipate along the Texas coast. Fog will continue along the Louisiana coast through Wednesday morning where visibilities could be below a quarter mile at times. An upper level disturbance is forecast to track northeastward across the Midwest on Tuesday. At the surface, an area of low pressure will develop in the Southern Plains and track northeastward along a stalled front. To the north of the low and front, cold air will remain in place across the region. With this upper level disturbance and area of low pressure providing ample lift, there will be the potential for wintry precipitation. Snowfall accumulations will range 2-4 inches with locally higher amounts in excess of 6 inches. Further south, there will be the potential for freezing rain. Accumulations will range 0.10-0.25 inch. A large upper level trough will slowly move eastward across the Plains Wednesday and Thursday. As this occurs, a surface low is forecast to develop in the lee of the Rockies and will track northeastward across the Midwest and Great Lakes Wednesday into Thursday. With cold air in place and the low bringing moisture northward, widespread wintry precipitation is expected across the region Wednesday into Thursday. Snowfall accumulations of 8-12 inches with locally higher amounts in excess of 15 inches are expected. In addition, freezing rain accumulations between 0.10-0.25 inch are forecast. Gusty winds will produce blowing and drifting snow. An area of low pressure is forecast to develop in the lee of the Rockies; the associated warm front will extend across the Central Plains and southern Ohio River Valley. Southerly flow throughout the day will bring warm moist air northward across the region. As the low moves eastward, strong wind shear and instability will increase during the afternoon. This will allow for the development of showers and thunderstorms; some will be strong to severe. Damaging winds and hail will be the primary hazards with these storms. 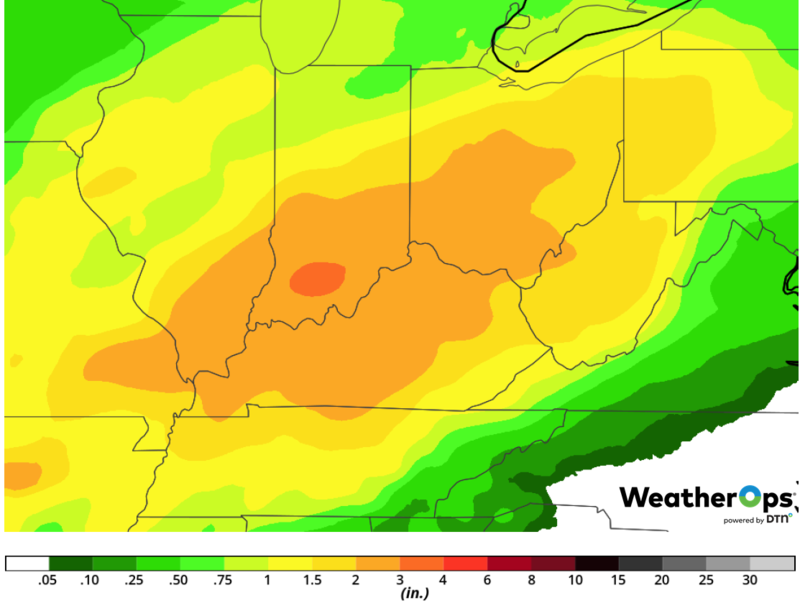 A stalled front will be situated over the southern Ohio River Valley Wednesday through Friday. To the south of the front, warm moist air will spread northward as a series of disturbances move across the region. Multiple rounds of showers and thunderstorms are expected Wednesday through Friday. With the lack of movement in the front, activity will train over the region, resulting in widespread heavy to excessive rainfall. Rainfall totals of 2-5 inches with locally higher amounts in excess of 7 inches are expected, leading to a risk for widespread flooding. Snow will extend from the Great Lakes into the Mid Mississippi Valley on Friday ahead of a cold front. An area of low pressure will bring the potential for rain and snow to portions of California on Saturday. By Sunday, snow may spread into the Rockies.